For the seventh consecutive season, one driver from each of the Big-Block Modified, 358 Modified, Sportsman Modified and Pro Stock divisions will walk away as Mr. DIRTcar Hometrack Champion in 2017. In 1976 the Mr. DIRTcar Hometrack Championship program was born. The Super DIRTcar Series program was used as a qualifier series for Super DIRT Week at Syracuse. In 1989, the Mr. DIRTcar Hometrack Championship program made a shift, adding a fall series to hometrack bonus points to determine the Mr. DIRTcar Hometrack title. From 2000 through 2010, the champion from the Super DIRTcar Series was also named Mr. DIRTcar. At the start of the 2011 season the Mr. DIRTcar Hometrack Championship was separated from Super DIRTcar Series points standings in order to recognize a separate champion. Rather than being tied directly to a touring series, the Mr. DIRTcar Hometrack Championship allowed DIRTcar Racing drivers who competed at DIRTcar-sanctioned tracks to earn points towards the Mr. DIRTcar title, rewarding the champion of each of the four divisions. Mr. DIRTcar Hometrack Championship now recognizes local heroes who run at weekly DIRTcar-sanctioned track in the Northeast. The champion in each of the four divisions takes home between $1,000 to $6,000, depending on that division. A driver’s best 16 finishes are recorded throughout the season, from January 1 through Labor Day Monday (September 4 this year). Drivers receive 60 points for a win, 56 points for second, and so on decreasing by two points through the field. Once a driver reaches 16 races, his worst finishes are thrown out, leaving only the best results to count towards the Mr. DIRTcar Hometrack Championship title. Since the Big-Block Modified division of the Mr. DIRTcar Hometrack Championship was separated from Super DIRTcar Series points standings, there have been two winners – Brett Hearn and Matt Sheppard. Since 2011, only one time has the Mr. DIRTcar Hometrack Champion been different from the Super DIRTcar Series champion. That came in 2014 when Billy Decker took home the Super DIRTcar Series Championship while Sheppard earned the Mr. DIRTcar Hometrack title. In 2016, Sheppard scored a perfect score in the Big-Block Modified division, tallying 16 wins. In the 358 Modified division, David Hebert narrowly edged out Erick Rudolph by two points to take home the 2016 358 Modified Mr. DIRTcar Hometrack title. Brad Rouse clipped Martin Pelletier by four points in the Sportsman Modified division, while Stephane Lemire topped Jocelyn Roy in DIRTcar Pro Stock action. 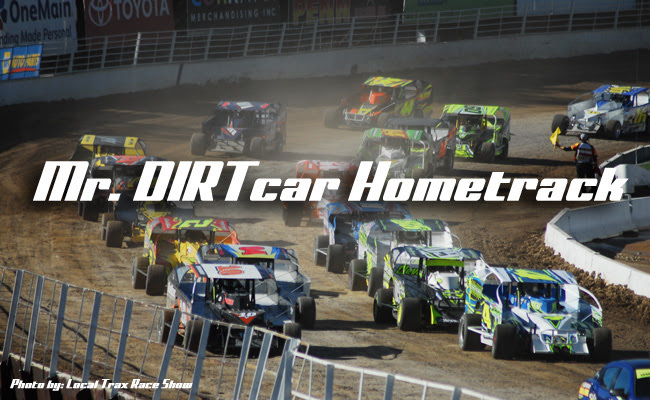 Stay up to date on Mr. DIRTcar Hometrack Championship standings and news through weekly news releases and social media highlighting the weekly Big-Block Modified, Sportsman Modified, 358 Modified and Pro Stock events, local tracks and stand out performances. Information on the championship points battles will be available at www.dirtcarump.com.